Today (01.02.2019) , Finance Minister Piyush Goyal has presented the Interim Budget in Lok Sabha. The Major changes in the personal Income tax is as under. 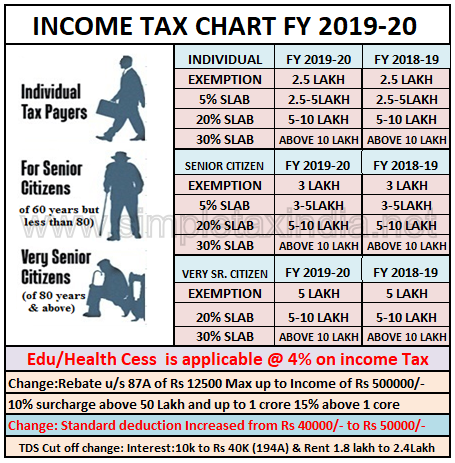 Rebate from income tax has been allowed maximum up to Rs 12500 u/s 87A to assessee having income up to Rs 500000/- .The benefit of this change will be available only if your taxable income is up to Rs 500000/- As per explanation given in Budget documents This Clause of the Bill seeks to amend section 87A of the Income-tax Act to provide relief to the individual taxpayers by increasing the maximum amount of tax rebate to twelve thousand five hundred rupees from existing two thousand five hundred rupees. The tax rebate shall now be admissible to taxpayers having total income up to five hundred thousand rupees, instead of existing three hundred fifty thousand rupees. 1. Increase in standard deduction amount :Clause 3 of the Bill seeks to amend section 16 of the Income-tax Act to provide relief to the salaried taxpayers by way of increasing the amount of deduction from salary income, from existing forty thousand rupees to fifty thousand rupees. 2. Nil value for 2nd self occupied house :Clause 4 of the Bill seeks to amend section 23 of the Income-tax Act so as to provide relief to the taxpayer by allowing him an option to claim nil annual value in respect of any two houses, declared as self-occupied, instead of one such house as currently provided. It further seeks to provide relief to the taxpayers that notional rent in respect of unsold inventory shall not be charged to tax up to two years, instead of existing one year, from the end of the financial year in which the certificate of completion is obtained from the competent authority. 3. No change in Interest amount for 2nd house as allowed as per sr no 2 above: Clause 5 of the Bill seeks to amend section 24 of the Income-tax Act to provide that the monetary limit of deduction on account of interest payable on borrowed capital shall continue to apply to the aggregate of the amounts of deduction in case of more than one self-occupied houses. 4.Two house can be purchased instead of One house in capital gain 54 section :Clause 6 of the Bill seeks to amend section 54 of the Income-tax Act so as to provide relief to the taxpayers having long-term capital gains up to two crore rupees, arising from transfer of a residential house, by affording the assessee a one time opportunity, at his option, to utilise the said amount for the purchase or construction of two residential houses in India instead of one residential house as currently provided. 6. Income up to Rs 500000 effectively exempted :Clause 8 of the Bill seeks to amend section 87A of the Income-tax Act to provide relief to the individual taxpayers by increasing the maximum amount of tax rebate to twelve thousand five hundred rupees from existing two thousand five hundred rupees. The tax rebate shall now be admissible to taxpayers having total income up to five hundred thousand rupees, instead of existing three hundred fifty thousand rupees. 7. Cut off limit increased 194AClause 9 of the Bill seeks to amend section 194A of the Income-tax Act so as to ease the burden of compliance by way of increasing the threshold limit from ten thousand rupees to forty thousand rupees, for deduction of tax at source on interest income, other than interest on securities, paid by a banking company, co-operative society or a post office. 8. Cut off limit increased 1941 :Clause 10 of the Bill seeks to amend section 194-I of the Income-tax Act to rationalise the threshold limit from one hundred and eighty thousand rupees to two hundred and forty thousand rupees, for deduction of tax at source on rental income. 9. Stamp duty related :Clauses 11 to 21 of the Bill seek to amend the Indian Stamp Act, 1899 for levy and administration of stamp duty on securities market instruments by the States at one place through one agency, viz., through Stock Exchanges or its Clearing Corporation or Depositories on one instrument, and for appropriately sharing the same with respective State Governments based on State of domicile of the ultimate buying client. 10. Attachment period increased for Money laundering Clause 22 of the Bill seeks to amend sub-section (3) of section 8 of the Prevention of Money-laundering Act, 2002 so as to extend the time limit of ninety days for which the attachment shall remain valid during the period of investigation to three hundred and sixty-five days and also to provide that in computing the period of three hundred and sixty-five days, the period during which the investigation is stayed by any court shall be excluded.